1987 何處是我朋友的家 Where Is the Friend's Home? Khane-ye doust kodjast? ^ Karen Simonian. Abbas Kiarostami Films Featured at Wexner Center (PDF). Wexner center for the art. 2002 [2007-02-23]. （原始内容 (PDF)存档于2007-07-10）. ^ 2002 Ranking for Film Directors. British Film Institute. 2002 [2007-02-23]. （原始内容存档于2012-03-12）. ^ Ivone Margulies. Abbas Kiarostami. Princeton University. 2007 [2007-02-23]. （原始内容存档于2007-06-21）. ^ Hamid Dabashi. Notes on Close Up – Iranian Cinema: Past, Present and Future. Strictly Film School. 2002 [2007-02-23]. （原始内容存档于2007-02-17）. ^ Rebecca Flint. Where Is the friend's home?. World records. [2007-02-27]. ^ David Parkinson. Abbas Kiarostami Season: National Film Theatre, 1st-31 May 2005. BBC. 2005 [2007-02-23]. ^ Close-Up. Bfi Video Publishing. 1998. ^ Hemangini Gupta. Celebrating film-making. The Hindu. 2005. ^ Jeremy Heilman. Life and Nothing More… (Abbas Kiarostami) 1991. MovieMartyr. 2002. ^ Jonathan Rosenbaum. Fill In The Blanks. Chicago Reader. 1997. ^ Film Info. And Life Goes On (synopsis). Zeitgeistfilms. （原始内容存档于2007-02-16）. ^ Stephen Bransford. Days in the Country: Representations of Rural Space .... Sense of Cinema. 2003. ^ Judy Stone. Not Quite a Memoire. Firouzan Films. [2007-02-23]. ^ Jeff Lambert. 43rd Annual San Francisco International Film Festival. Sense of Cinema. 2000. （原始内容存档于2010-12-25）. ^ 19.0 19.1 Ginsberg, Terri; Lippard, Chris. Historical Dictionary of Middle Eastern Cinema. Scarecrow Press. 2010-01-03: 236 [2014-10-19]. ISBN 978-0-8108-6090-2. （原始内容存档于2013-07-20）. ^ Ebert, Roger. Roger Ebert's Movie Yearbook 2012. Andrews McMeel Publishing. 2011-12-06: 93. ISBN 978-1-4494-2150-2. ^ Abbas Kiarostami. IndiePix. 2004 [2007-02-23]. （原始内容存档于2007-10-22）. ^ Abbas Kiarostami. Cannes Film Festival. [2007-02-23]. ^ Nick Vivarelli. Kiarostami to head Capalbio jury. Variety.com. 2007-06-11 [2007-06-16]. （原始内容存档于2007-10-30）. 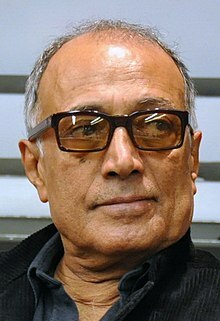 ^ Iran cinema: Abbas Kiarostami, award-winning film director, dies at 76.BBC.2016-07-04.[2016-07-14]. ^ 直击阿巴斯万人葬礼现场：一起草率医疗事故断送的伟大生命. 澎湃新闻. 2016-07-13 [2016-07-14]. ^ Cynthia Rockwell. Carney on Cassavetes: Film critic Ray Carney sheds light on the work of legendary indie filmmaker, John Cassavetes.. NEFilm. 2001 [2007-02-23]. （原始内容存档于2007-04-26）. ^ Wray, John. Minister of Fear. New York Times. 2007-09-23 [2008-10-24]. ^ Iranian director hands back award. BBC. 2002-10-17 [2007-02-23]. ^ Jacques Mandelbaum. No entry for Kiarostami. Le Monde. 2002 [2007-02-23]. ^ Martin Scorsese goes global. US today. 2007-05-22 [2007-05-29]. ^ Kiarostami joins Scorsese project. PRESS TV. 2007 [2007-05-29]. ^ Narguess Farzad. Simplicity and Bliss: Poems of Abbas Kiarostami. Iran Heritage Foundation. 2005 [2007-02-23]. （原始内容存档于2007-09-27）.